The fourth installment in the Excel University series covers the Excel features, functions, and techniques that will help you build reliable workpapers. The items covered in this volume will help improve your productivity so you can get your work done faster! Work at your own pace during the one-year enrollment period. 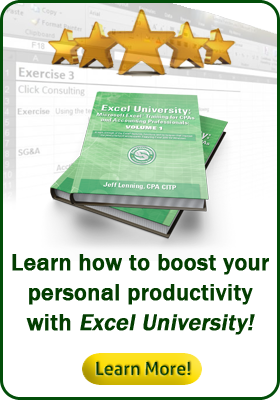 This course teaches the content of the Excel University Volume 4 book. The book chapters are available digitally inside the course during the enrollment period. Obtaining a printed/bound copy of the book is not required. If you'd like to purchase a printed/bound copy of the book, which is optional, you may do so through Amazon. • "Very engaging, fun class!" • "Valuable resource to increase personal organization and productivity." • "Excellent presenter, would recommend." • "Very good training, would recommend to other professionals." • "Being exposed to new formulas and functions was valuable." • "Book is great for my future reference." • "Great course, really going to try to implement new things learned." • "Thank you goes to Jeff for great training- very helpful and useful." • "Really enjoyed Jeff. Very knowledgeable and great presenter. Exercises were also very helpful." Ensure you have access to Excel for Windows, preferably versions 2010 or later, so that you can work through the required homework exercises. Excel for Mac is not officially supported.